The environment and the people there is quite friendly. Close to lots of shops...especially the yellow food stall oposite-amazing food! Nice sized room with good balcony and tv. Big bed. Good sized fridge and kitchen sink! It’s my 5th time in Patong. I knew it already nanai road and it’s a great location. 5 minutes walk to the centre and 10 minutes walk to the beaches. Swimming pool it’s nice. All food was amazing, staff were so friendly and helped us out with best places to go, taxis, laundry etc. The staff is very nice and helpful. You can purchase trips around the islands from the owner and even exchange money. The politeness of the staff, the location, the quality and cleanliness of the room and common areas, the extra services available in this structure. Also have a nice buffet party on fridays afternoon!! I strongly recommend this place. Personel try to help. Sometimes cannot but it try. The Villa Residences This rating is a reflection of how the property compares to the industry standard when it comes to price, facilities and services available. It's based on a self-evaluation by the property. Use this rating to help choose your stay! The Villa Residences is a 15-minute walk from Jungceylon Shopping Mall and a short distance walk from Bangla Road. It offers rooms with free Wi-Fi. Guests can make travel arrangements at the tour desk or rent a motorbike at the front desk. Guests can also relax by the outdoor pool. This property is 650 feet from the city centre. 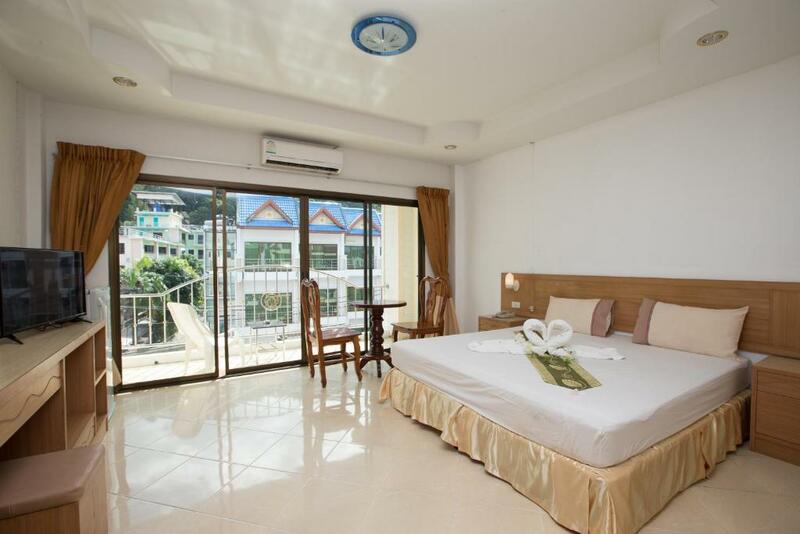 It is a 2-minute drive to Patong Beach and a 45-minute drive to Phuket International Airport. Rooms at The Villa Residences are fitted with tiled flooring. Each room comes with a cable TV and a safety deposit box. Shower facilities are included in an en suite bathroom. Selected rooms feature a private balcony. For convenience, the property is equipped with laundry services and free private parking. A billiards table is also available for guests to enjoy. In-room Thai massage service is available upon request. For local delicacies and seafood dishes, head to nearby restaurants located within a 2-minute walk from the hotel. A buffet barbecue is also available on-site for an additional charge. Breakfast and burgers can also be enjoyed at the restaurant. When would you like to stay at The Villa Residences? House Rules The Villa Residences takes special requests – add in the next step! The Villa Residences accepts these cards and reserves the right to temporarily hold an amount prior to arrival. A prepayment deposit via PayPal is required to secure your reservation. The property will contact you after you book to provide any PayPal instructions. Please note that the hotel requires guests to provide arrival details prior to the check-in date under "Special Requests" during the booking process. Guests can also contact the hotel directly with contact information found on the booking confirmation. Please be informed that during the low season (May to October), the reception will be opened from 09:00 - 22:00 hrs (open 24 hours during November - April). 24-hour room service is available during high season (November to April). 1. bed sheets are too old to see whether its clean or not. 2.hard to see any stuff. No working safe in the room. No-one on reception at most times...the lady of the attached bar helped me with most of the queries. However the owners were polite and helpful when I did speak to them and often asked if the room was ok. A taxi ride from beach. We could not check in until 7pm and we had hoped breakfast was included but it wasn't. Room was nice, owner was friendly great location - only about 10-15 minutes walk to the mall, Bangla road and Patong Beach. An 3 star hotel cannot let me pay by credit card? After 10 minutes argument I have to go to the hotel next door for charge the room on my credit card. unacceptable! I stay an extra night bc everything was fully booked everywhere and I had must pay with cash if I want an extra night. unacceptable! 40€ Wifi was really bad! Reception always empty, nobody to ask information, only a girl in the bar (different business). Room cleaning NOT everyday. Which is in Thailand after 5 times is the first hotel didn’t do it. I had to ask for toilette paper! Shower cannot change temperature! My personal opinion isn’t 3 star hotel, max 2! Only missing thing is they can't use credit card. Hope they can fix this soon. All other things are good. You don't get disturbed by the noise and have very clean rooms. Staff are helpful and not around all the time but you can easily call someone if you need help etc. 10/10 for price / performance. Btw they don't require to pay deposit.